Kendra Peterson is the newest member of the Taatjes Financial Group team. As Director of First Impressions, Kendra is the first smiling face you see when walking in the door of our firm. 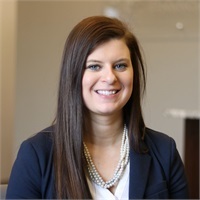 She will also be scheduling appointments, assisting in a variety of firm projects, and helping us to provide the highest quality of customer service to the individuals and families we serve. Kendra comes to us with a strong understanding of the financial services sector. She graduated from Minnesota State University, Mankato with a degree in Business Management. She has obtained her Resident Insurance Producer license, Series 6 license, and Series 63 license. Kendra lives in Clara City with her husband, Sam. As a MACCRAY graduate, she enjoys following local sports. She is also an avid golfer, when the weather is nice.